16 Apr Volume and lack of follow up rain weighs on market. 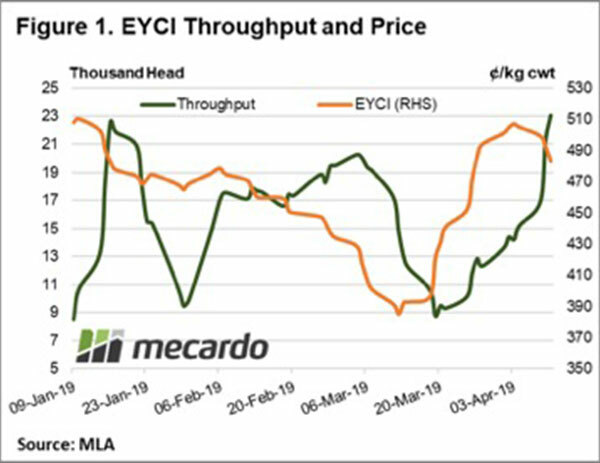 The Eastern Young Cattle Indicator (EYCI) eased 5% on the week to close at 481¢/kg cwt as limited rainfall and higher throughput conspired to weigh on the market. This move was mirrored across the broader national cattle market, except for the Medium and Heavy Steers. Improved young cattle prices during late March/early April have seen yarding levels of EYCI eligible cattle lift 42% from averaging over 14,300 head per day last week to 21,250 this week. The result of the increased volume pressured the EYCI to ease 5% after peaking at 507¢ last week (Figure 1). Improved prices were not the only attraction drawing out young cattle though as limited rainfall across the country this week (Figure 2) saw the daily EYCI cattle yarding reach a peak of 23,803 head on Thursday. This was the highest daily throughput level recorded so far this season. Higher saleyard volumes on the back of the limited rainfall hampered other east coast categories of cattle with falls in the week between 5¢-15¢ noted. National Heavy and Medium Steers were two of the few categories managing to gain on the week to close at 275¢ and 282¢ liveweight, respectively. The Bureau of Meteorology released their mid-month preview of the three-month climate outlook on Thursday for the May to July period. The picture of a 50/50 chance of a wetter or drier than average rainfall pattern remains in place, albeit with an increased chance of slightly drier than normal trend for southern Queensland and a wetter prospect for southern WA (Figure 3). The only significant rain for the nation next week is scheduled to fall in Western Australia so there will be limited opportunity for East coast cattle prices to recover. Expect further consolidation for the short term as robust beef export prices and healthy processor margins will keep buying support present on price dips, while lack of rain will continue to be a headwind on prices racing higher.